I haven't made fish dishes for a long time and I was really craving it. Since we have been eating very flavourful food for a while, I wanted to make something light and refreshing. After going through my fridge, I came up with this recipe. This fish dish was supposed to be made with river fish however all I had in my fridge was cod. I used egg white to bring out the softness and cooking wine to balance the smell of ocean fish. My 20 month-old daughter loved the fish, she kept asking more and more. She ate a whole piece of fish just by herself which was never happened before. This dish is simple and easy to make, I made this dish while making a side dish at a same time. It takes about 15 minutes. Slice the cod, make sure not to slice too thin. Slice water chestnut and white mushrooms. Cut the green onion approximately an inch and a half long. Marinate the fish. Mix all the frying sauce in a bowl. Bring half a medium pot of water to a boil. 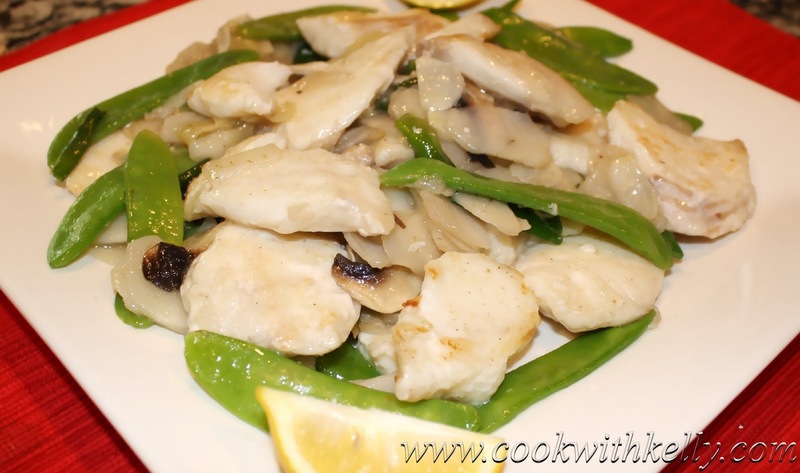 Blanche snow peas for a minute and then blanche water chestnut and white mushroom. Transfer everything to a plate. In a nonstick medium saucepan or a wok, heat 1 tbsp oil over medium-high heat. Add the marinated cod to cook. Make sure to cook both sides - about 5 minutes, until the cod is well done. Drain and then transfer to a plate. Wash the pan and then heat 1 tbsp oil over medium-high heat. Add garlic, ginger, green onion, water chestnut, mushroom and snow peas to fry. Stir everything for about 2 minutes, add cooked fish and frying sauce. Mix everything evenly. Transfer to a serving plate.